Doors From Dishes: Interview time! Tell us about the tools you are using for this project. What does the process look like for a project like this? 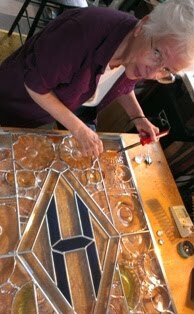 There are several tools being used for this project, most are quite familiar to even the newest members of the stained glass club. 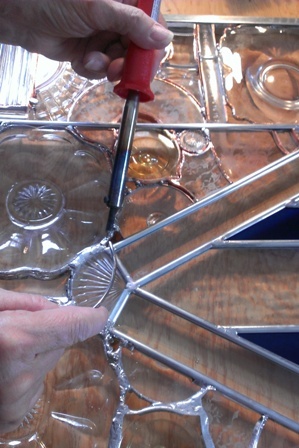 The glass cutters I use are about as basic as could be, and many date back to my own earliest days in the medium. Many are older than my own, grown children! The glass cutter is a scratching device that scores a single line into the glass, making a weakness in the glass along which I hope it will break. I say "hope" because the glass often has its own designs on how to break. Lots of practice can help dial in the accuracy of these early steps, as can my array of various pliers which are designed to control the break. If the cut/scoring is done properly, and a confident technique is applied to the break, I am rewarded with a clean SNAP and nice smooth edges to work with in my pieces. If not - well, things get messy pretty quickly and then other tools come in to play for the "recovery" phases. There are multiple pliers in my arsenal which exist explicitly for "grozing" the glass edges... that is to nip away at the jagged edges that didn't cooperate and to pull off as much of the razor sharp shard as possible. Once the glass is manually cut and grozed to size, it's time to use the electric grinder to grind away any final errors in my desired shape. 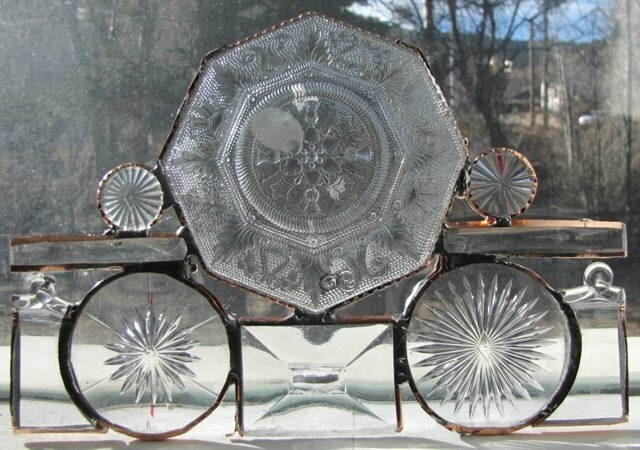 Even the smallest burr can mis-align a piece and every piece needs to nest perfectly next to its neighbor if the window is to come to an exact, pre-determined measurement. Sometimes my windows and projects CAN grow, and it's fun to allow the glass space to do its own thing. But in this case, the finished panels must fit into the existing door spaces. So no surprises are allowed! 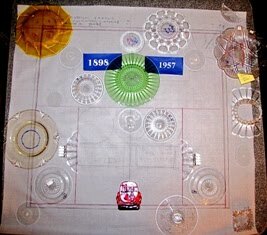 When it comes to building a window out of dishes, bowls, cups and saucers, a whole new series of cutting complications arises. Glass likes to break along weak spots, or lines that are thinner than the rest of the glass. So a piece of glass with a pattern already scored or molded into it is a completely different creature from what I normally work with. It is for this purpose I bring to task my newest tool, a ring saw, which can grind a thin gap down a solid plate (for instance) to separate it into two or more pieces without the danger of having to snap it and hoping it goes the way I want. The ring saw allows me to carve into a three dimensional bowl or dish much more easily than any of the other tools I could use. It's been a dream come true for this project! 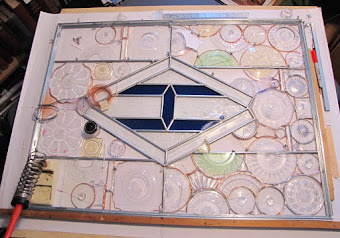 Next, when the pieces are all cut to size and fitting perfectly, it's time for foiling or calming. Foiling is the process of applying a thin adhesive copper tape to the edges of each piece so that they can stick together. If the pieces are large (like the center "H" on each panel) I can use calming (pronounced "Cay-Ming" to rhyme with framing). 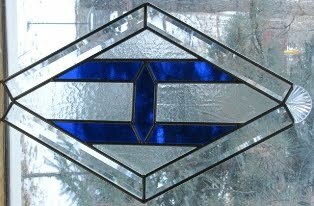 Calming is an H-shaped strip of metal that is used to hold glass in place in the finished window. 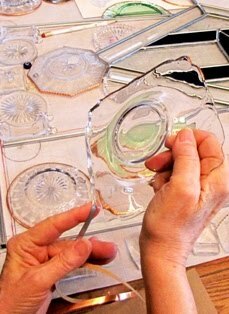 It's very hard to use with small details, but for the larger pieces it does the job perfectly, as it has done for centuries of glass workers before me. After the foiling, the pieces are still loose, so it's time to "glue" them together. A quilter uses needle and thread. A stained-glass-window maker uses solder (pronounced "sodder") This is a simple process of applying an acid to the copper foil around each piece of glass (to clean it and make the copper accept the solder) and then melting the lead solder into place. It's the same process used for fusing electrical components together, just on a much bigger scale! When every millimeter of my design is foiled and soldered, and every joint and connection has been adequately sealed and checked for good adhesion, it's time for my "favorite" part: Cleaning. Cleaning each window is actually quite a chore, but it is critical to the success of the final product and making sure it's done right. This is not the time to get lazy! This is a great time for quality control and to run my fingers over the entire project to make sure that nothing's loose and there are no missing pieces or forgotten lengths of copper foil to be attended to. Once cleaned, it's time for delivery and installation and I have to say "goodbye" to my newest creation. It's often hard to leave a piece I've spent so much time on, but it's always a pleasure to see the finished product in its final home where it belongs. 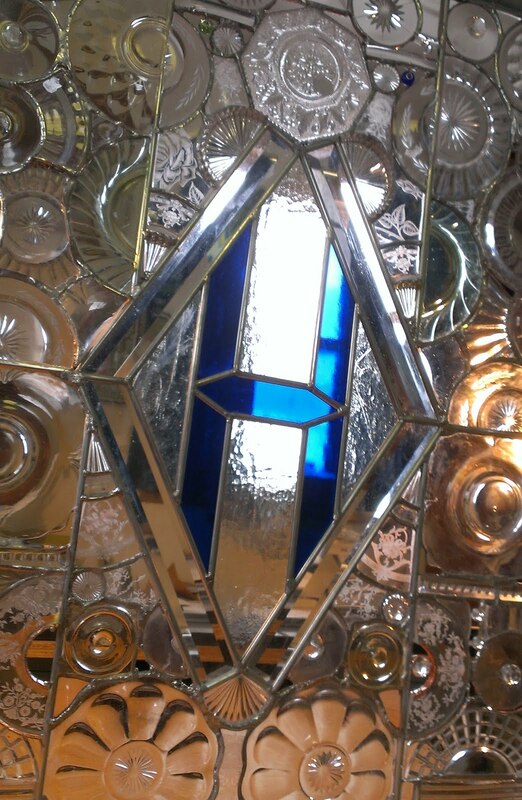 Glass doesn't work without light shining through it. 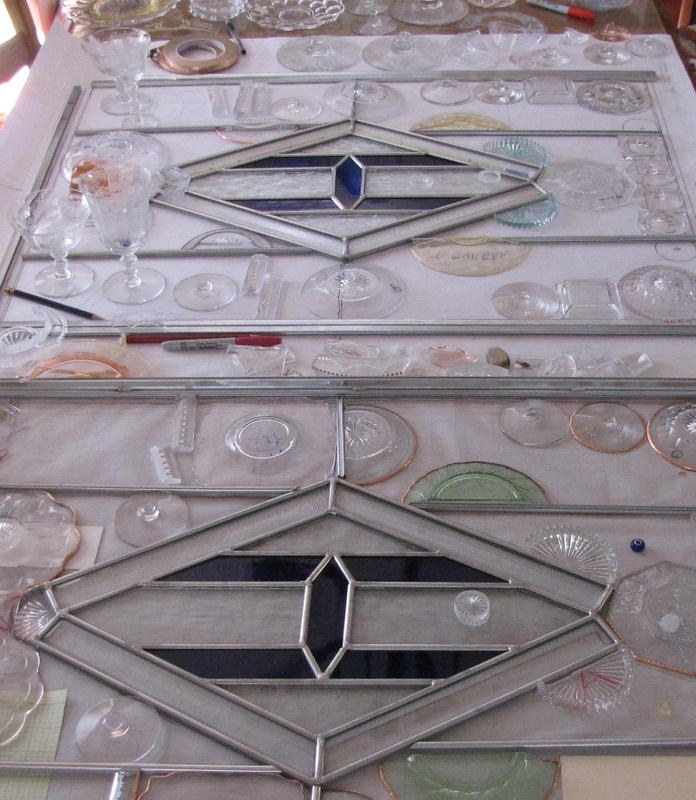 And as pretty as my work is on my worktable (or in the bathtub!) it's always so much prettier where it belongs. My other tools include what you'd expect of any artists' table, I suppose, with rulers and straight edges, and paper towels and cleaning supplies and markers and pencils and paper of all sizes. My layout tables are nothing more than re-purposed doors themselves. My favorite tools are my secret weapons: dental tools. Those are perfect for getting into the fiddly little corners and edges of glass nested TOO perfectly together, and they come in so many useful shapes and sizes. I don't know where I'd be without them! Popsicle sticks are indispensable too, when it comes to laying out glass (or in this case dishes) with different thicknesses and depths. Popsicle sticks, dental tools, pushpins and about ten thousand other makeshift solutions find their home in my workshop. Glass isn't demanding beyond a little respect and a little education. Heisey, of course, demands its own reverence, but it's still the same stuff I've always worked with before. Like an old friend in a shiny new outfit. Each design has its own story to tell. Each piece of glass is a tiny little adventure. With these panels? The adventure is blooming before my very eyes and I couldn't be more excited to be a part of this engaging, inspiring project.